An engineering and arts student leader at UBC's Okanagan campus has been chosen as this year's Outstanding Future Alumnus by UBC. Rachael L'Orsa, who graduated last June with a Bachelor of Applied Science degree and is currently completing a Bachelor of Arts degree, received the award at this week's UBC Blue and Gold Review, a gala ceremony for the annual Alumni Achievement Awards at the Chan Centre at UBC's Vancouver campus. "This award recognizes someone whose commitment to academic excellence and significant involvement in university affairs inspires others and improves the campus community," says Brenda Tournier, Senior Manager of Alumni and Community Relations at UBC's Okanagan campus. "Rachael's contributions to her community and to UBC are extraordinary, and she is an extraordinary person -- definitely an outstanding alumnus, and one who has an incredible future ahead of her." Completing two degrees while serving on UBC's Okanagan Senate and working as a paramedic and student researcher may sound like a lot for most people, but L'Orsa is accomplishing all these tasks to an exceptionally high standard. Despite a demanding academic schedule, L'Orsa has become very involved in the university community. While working towards her BASc in mechanical engineering, L'Orsa was a member of the Engineering Undergraduate Society, taking the lead on a variety of workshops and events. She also represented her peers and earned the respect of her seniors as a student senator on the University Senate. Her leadership ability and willingness to volunteer was also evident in her roles as team leader for her fourth-year capstone project group and for several successful competition teams for the Faculty of Applied Science. L'Orsa is currently a science ambassador with the Irving K. Barber School of Arts and Sciences. This position involves delivering dynamic, engaging science (and engineering) presentations to school children in order to pique their interest in science-based activities, education and careers. Two of her Grade 7 mentees won honourable mentions in the 2010 Canada-Wide Science Fair. She has also worked as a student coordinator for the Women in Engineering program aimed at female high school students. 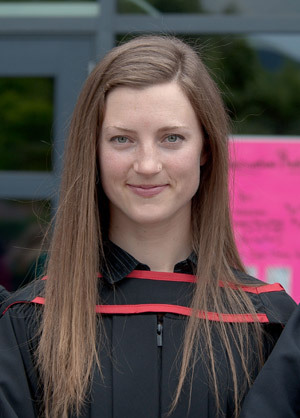 She consistently placed in the top five per cent of her class while receiving numerous merit-based scholarships (including the largest awarded by the Canadian Aeronautics and Space Institute), as well as three separate NSERC awards and a UBC Okanagan Undergraduate Student Research Award. Now registered in the Faculty of Creative and Critical Studies, L'Orsa is on track to graduate with her BA in French and Spanish (with a minor in computer science) next spring.